The B.I.D.E. is the United Nations-sanctioned "Bureau d'Investigations pour la Defense des Especes" [Bureau of Investigation for the Defense of Species]. It has its secret headquarters in Paris under the Arc-de-Triomphe. Its chief is Prince Vrougnard des Alpiges du Tarpoin-Bossuet, nicknamed Monseigneur. Monseigneur is assisted by the lovely Polly Esther and the grouchy, cigar-smoking "Graffiti". He is also accompanied by a U.N. bureaucrat, Astra-Khan. In the first adventure, the B.I.D.E. 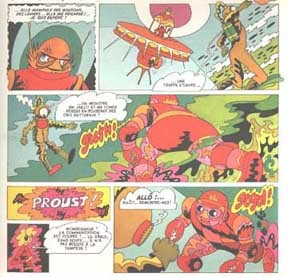 defeats advanced space-faring humanoid lobsters who have come to our planet to rescue their Earth-based "brothers". 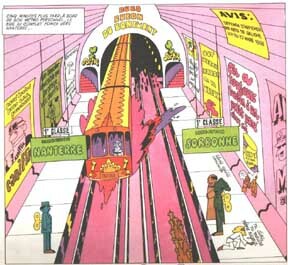 The second story begoins with the kidnapping of Prof. Helmut Lepain-Delabouche and is a homage to Jules Verne's Journey to the Center of the Earth, making use of satirical political and cultural metaphors. Les Dossiers du B.I.D.E. 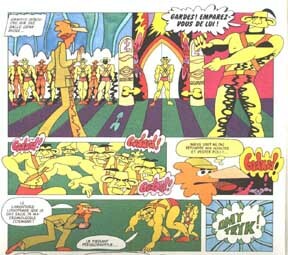 were published by Belgian publisher Casterman as two graphic novels; the first story was previously serialized in woman's magazine ELLE in 1968-69. 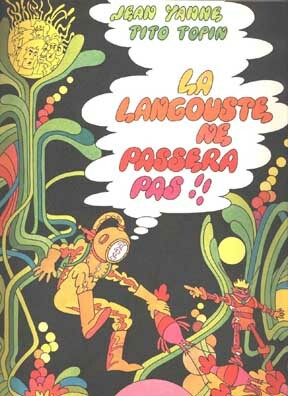 The first book was a highly mediatized event, trying to cash in on the celebrity of Jean Yanne, the then-popularity of Pop Art, the left-wing politics of 1968, mixing James Bond, science fiction and pop culture elements. It was not nearly as successful as the publishers had hoped for, and the second book was released without fanfare a few months later, then the series was discontinued. Jean Yanne (left) (pseudonym of Jean Gouyé) (1933-2003) is a renowned French actor, director, producer, screenwriter and comedian. He started as a stand-up comic but became a noted actor in the early 1960s, appearing in Godard's Weekend (1967), Chabrol's Que la Bete Meure [This Man Must Die] (1969) and Le Boucher [The Butcher] (1970). He won a Best Actor award at Cannes in 1972 for his role in Pialat's Nous ne vieillirons pas ensemble [We Shall Not Grow Old Together]. 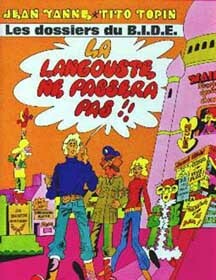 Yanne's first film as producer / director / actor / writer was the box office comedy hit Tout le Monde il est beau [Everyone Is Beautiful] in 1972. 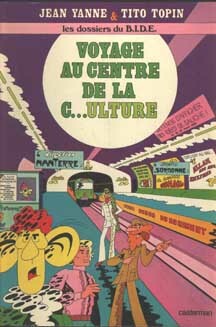 He followed this films with other hits such as Les Chinois à Paris [The Chinese In Paris] (1974); Deux Heures Moins Le Quart Avant Jesus Christ [1:45 B.C.] (1982), Le Paltoquet [The Coward] (1986), etc. Tito Topin (right) left comics and illustration in the 1980s and has become a noted television writer. His personal site here.